A mammogram is a special X-ray of the breasts that looks for breast cancer. A mammogram can be done when you have no symptoms (this is called a screening mammogram), or to investigate lumps, or other concerning symptoms (this is called a diagnostic mammogram). Women between the ages of 45 and 69 are entitled to a free screening mammogram every two years. If you're outside this age group you can still have screening but you'll have to pay for it yourself. In Canterbury, there's extra funding for screening women at a higher risk of getting breast cancer. In some circumstances, the radiologist (who interprets your X-ray) may recommend an ultrasound test instead of, or as well as, a mammogram. Health professionals don't recommend thermography for screening or assessing breast symptoms. This website has information about the New Zealand breast screening programme. This is a free programme for women aged between 45 and 69. The website has a number of resources, frequently asked questions, and personal stories. Phone 0800-270-200 for more information or to register. This page has information sheets and brochures about breast screening. This factsheet explains what a mammogram is, how it works, why it is used for screening, and what to expect. This is the brochure provided when you have been asked to return to BreastScreen Aotearoa for further tests or an assessment because something on your mammogram needs further checking. This brochure is also available in Chinese (simplified), Hindi, Japanese, Korean, and Thai. 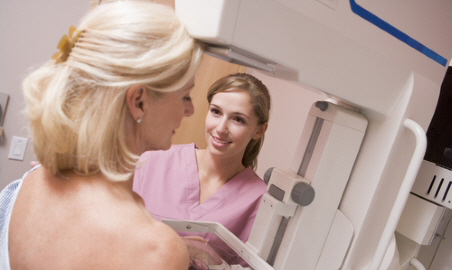 These factsheets have information about breast X-ray examinations for screening and diagnosis. This website has video interviews with a range of women who discuss their experiences with breast screening. Written by HealthInfo clinical advisers. Endorsed by clinical director, Radiology, Canterbury DHB. Last reviewed December 2018.